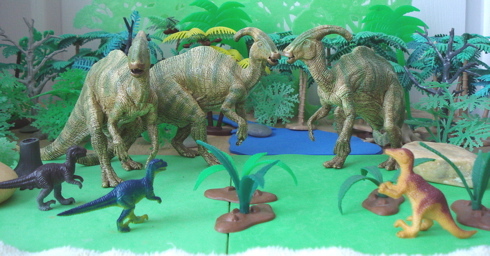 The Parasaurolophus makes very popular Dinosaur toys by PAPO. 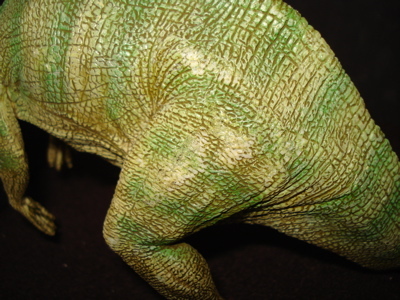 There are Dinosaur toys and then there are Dinosaur figures that are classified as toys, can be happily played with and readily thrown into a toy box without damage. 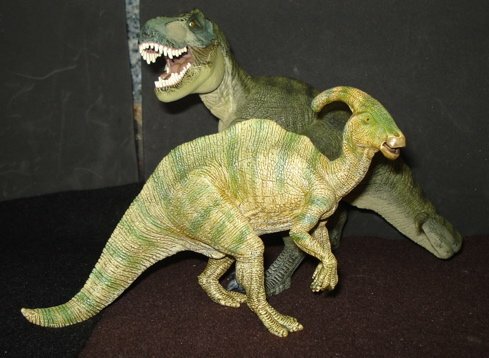 But when compared to other "Dinosaur toys" stand head and shoulders above the rest. 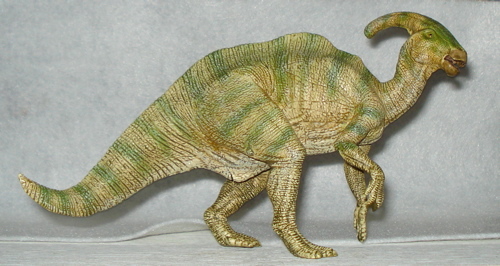 This describes the PAPO Parasaurolophus. 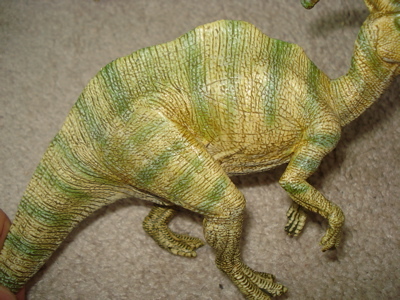 2005 saw the introduction of a number of beautiful, extremely detailed and highly "realistic" Dinosaur toys by PAPO. These include a Spinosaurus, a Stegosaurus, a Triceratops, this superior Parasaurolophus and seven others (plus a Mammoth & two cavemen). 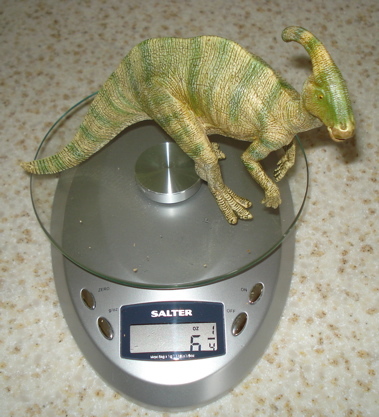 Weighing in at six-and-a-quarter ounces (6.25 oz, 177 gms) and measuring ten-and-a-half inches (10.5", 26.8 cms) in length, and given an average length of thirty-five feet (30-40) this figure comes in exactly at 1/40 scale. Just as advertised. 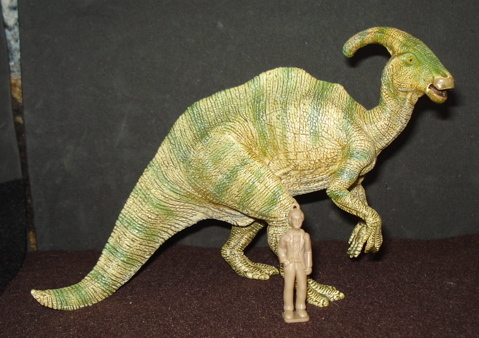 It is significantly smaller than the PAPO T-Rex (Below). 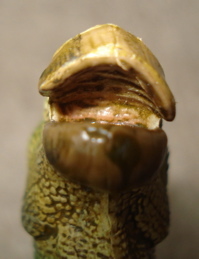 the interior of the mouth shows both the tongue and the detail of the upper palate. While the original had hundreds (thousands?) 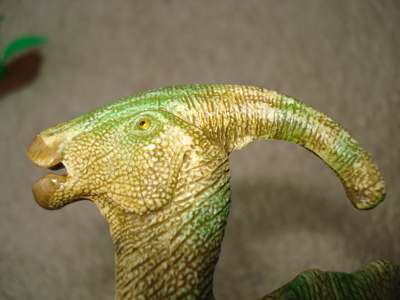 of teeth in its mouth that enabled it to grind its raw vegetarian meals the Papo Parasaurolophus has only six teeth to be seen in the front of its lower jaw. 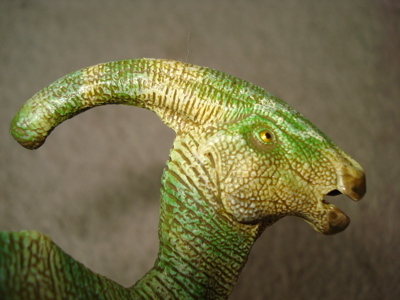 The Parasaurolophus was a herd animal. A vegetarian leading its life in the company of dozens, if not hundreds (or thousands) of its kind. They were thirty to forty feet of tastiness with no natural defenses, relying on the herd and perhaps a certain sense of anonymity for protection. "I understand that you taste like chicken. (Whatever that is.)" 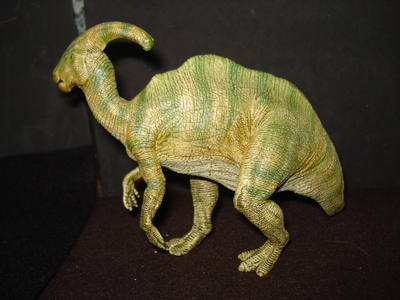 If you do decide to 'tip' them forward you can also straighten out the left arm, pulling it forward a little and creating, should your Parasaurolophus refuse (for some reason) to become bipedal, a three-point stance using the left forepaw as the third point of balance. This slightly more horizontal posture is more in line with current paleontologic thought as well. 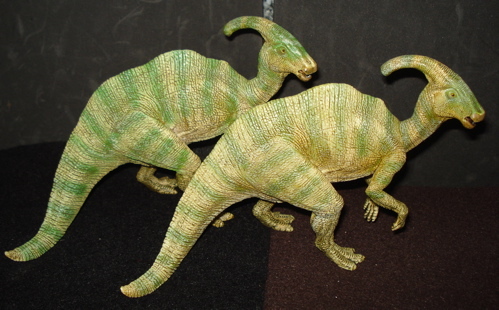 The real Parasaurolophus are presumed to have been both bi- and quadropedal in their choice of locomotion. Perhaps milling about, searching out food and migrating on all fours. But running (stampeding?) and "standing tall" searching the horizon for predators on its back legs. 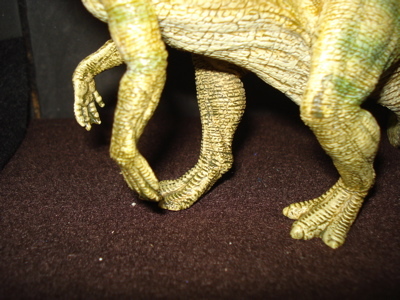 In any case both front "arms" and rear legs are very well detailed. "Go away. We know you're back there. We can survive traffic so you're no threat." "You guys have got to be kidding." 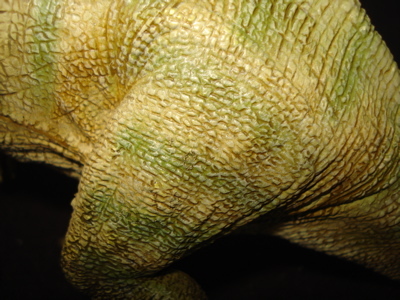 The detail of the skin is just superb, sculpted throughout with "scales." The musculature is delineated and skin folds sculptured in such a fashion as to be as life-like as possible. 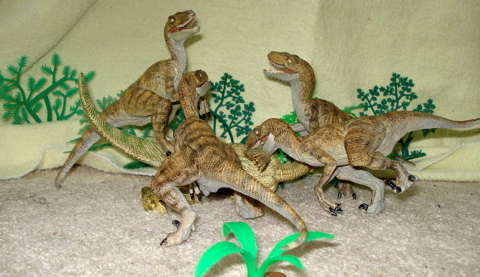 Impatiently awaiting their own page these petulant predatoys are determined to create havoc on other Dinosaur toys pages. They seem quite up to the task that they have set themselves as they quickly bring down their prey. 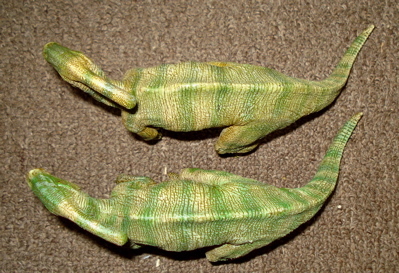 The Papo Parasaur is sculpted in an active, dynamic pose best seen by looking downward (left- they are both the same size, it's just the camera angle) and the best profile view is of the right side, as it is turning away when viewed from the left side. 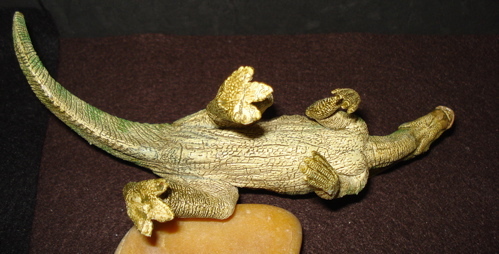 The belly (below) is also well detailed and if there is a detailing flaw it is in the bottoms of the feet, which are just flat. This really makes no difference at all to the overall figure though, just a minor oversight... really. It reads, quite simply, "c PAPO 2005 Made in China 'CE'." 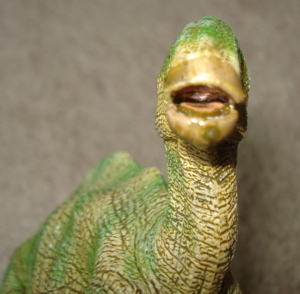 It does not have the Dinosaur toys name, scale, home town or any other miscellaneous and/or un-necessary information. 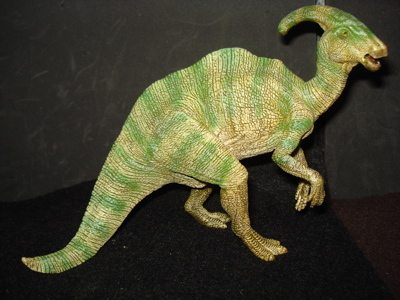 The Papo Parasaurolophus is, in January 2010, the best you can buy at what is both a competitive and highly affordable price (ranging online from $11.61 to $17.67, plus shipping). Go to Hotaling Imports for a list of brick & mortar stores near you. ...or, no need to choose, simply get them all. 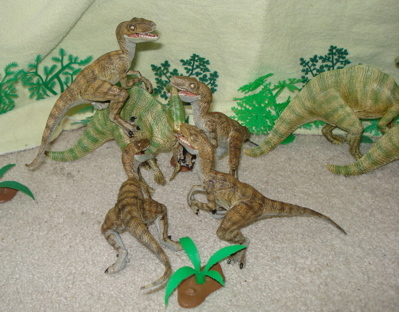 Papo currently makes eleven different Dinosaur toys (plus a Mammoth) that will provide a lifetime of enjoyment for the most discriminating (and/or picky) child or adult Dino-fan. These are high enough quality to satisfy the most critical adult while meeting the toughness standards of almost any child. I highly recommend the entire line. And every Dinosaur collector needs prey. 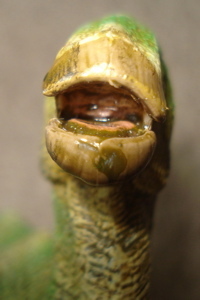 All Papo Dinosaur toys are warranted to be non-toxic (they have to pass expensive testing for importation into the USA) and have the Euro-Union seal of approval, the ubiquitous 'CE'. 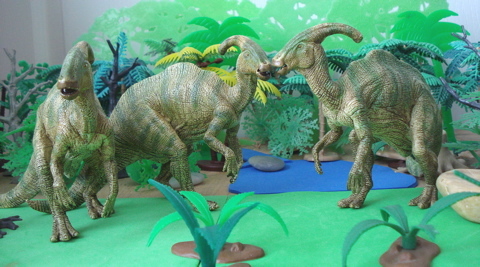 You have been reading our Parasaurolophus page. 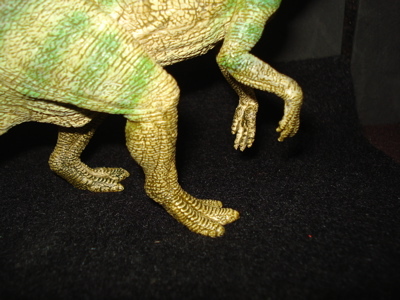 Click here to return to the main Hadrosaurus page, thank you.